Cut plastic handle along webbing edge. Wrap handle with mole skin to reduce handle size and pad rough edges. 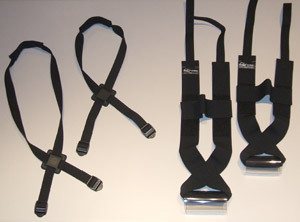 Mixing shoulder harness and arm strap sizes is available to accommodate unique sizes and/or different arm lengths (bilateral sling) of individuals. 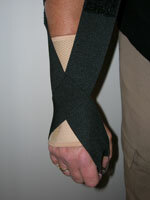 To order additional elbow straps and shoulder harnesses online, please click here.